Thanks for the great giveaway and for opening it to worldwide entries. This would make a wonderful Christmas gift ! Amazing giveaway and such beautiful books.Thanks for making it international. This is really epic! Enter me please, thank you. Amazing giveaway!!! Thank you so much!! I would never call this giveaway a monster, it's so pretty! :) Thank you so much!! 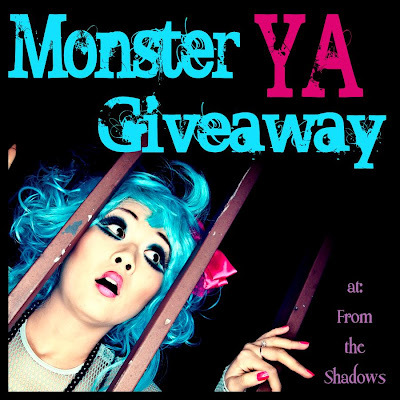 massive giveway plus its International too... plus it has Supernaturally by Kiersten White too!!! plus for the 4th time lol Legend of Witchtrot Road by E.J. Stevens... what more than just awesome this is? Really awesome giveaway! :) I'd love to win. Fingers crossed. I have been a follower for a long time. I would love to win one of your books! I still don't have one. Thanks for the great giveaway!!!!! OOOH what a great selection of books! Thank you so much for the chance to win! I love the name of the give away MONSTER YA rawrrrrrr!!! Thanks so much for the giveaway. I would love to win this!! Awesome giveaway.Please count me in. Great book choices! Thanks for the giveaway! Nice giveaway! I would love to read all these books! Thanks! GFC: Proserpine! OMG! Two out the three are already in my to-read list! TY for this generous giveaway chance! What a great set of books! Thanks for the giveaway! I would LOVE, LOVE, LOVE to win these books! Woooooot! Great event! Thank you for the chance to win! Great contest! Please count me in too! I've been wanting to read all 3 of these books! This is a fantastic giveaway, thanks for the chance to enter! There is always an awsome giveaway on this site. Thank you for them! Thank you for this awesome Giveaway! Count me in. This books are really wonderful. thx so much for the giveaway! Great giveaway! 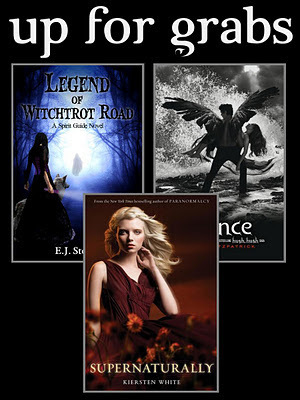 Currently reading She Smells the Dead, and I don't have Legend of Witchtrot Road for when I'm done Spirit Storm! Yeah! And international! Whoo! *big hugs* This is a great giveaway!! This giveaway is awsomeeeeeeee! I'm so glad. Thanks for the giveaway- great books here, I want them! Please enter me. Awesome giveaway! Thanks for the chance!! Thanks for the giveaway!! I've been wanting to read all of these! Great giveaway! Please enter me in it! Thank you for this amazing Giveaway! It would be a wonderful gift for my sister because she's a big fan of YA books. I wish I win. Awesome - all books I have yet to read! Great giveaway! Would love to win any one of these books. What an awesome giveaway! I would be thrilled to win these books- they are all books that I have marked down to read! Thanks for the chance!